Sanket is an easy going, loving boy with an infectious smile who cared deeply for others. He never troubled his parents for anything. He just gave his 10th board exams. Unlike other children who have plans for vacation, he was prepared to help his father on the farm. Little did he know that his family has to move to a completely different city to save him from cancer. On a visit to the doctor for mouth sores, the family was surprised to know he needed tests instead of medicines. Sanket's father, an uneducated farmer, was in denial until the doctor sat him down and patiently explained about his son's blood cancer. Even now, the sores do not heal, and he is in pain all the time. They are fighting to get him the treatment he needs. "We did not take it seriously until he fell sick and became weak. Even before we could take him to the hospital, his pain got so severe that he wasn't able to eat or sleep. Now, he keeps vomiting from the pain and because of chemotherapy. " "I'm a farmer, we have never stepped out from our village in Maharashtra. We had only one thought, to save our son at any cost. With the help of villagers, we brought him to Hyderabad because the hospitals near us could not help him. By then his condition became worse. He needs 3 more cycles of chemo, I don't know how his body can endure this pain." 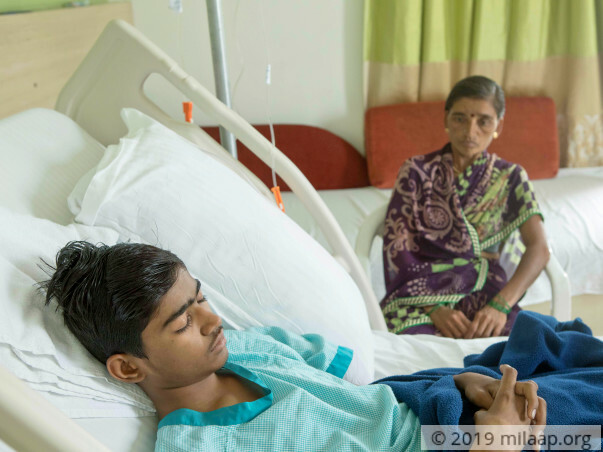 Sanket's parents have rented a small room near the hospital. They have to stay here till the treatment is completely over. He sold the piece of land he had in his village and borrowed money from villagers. 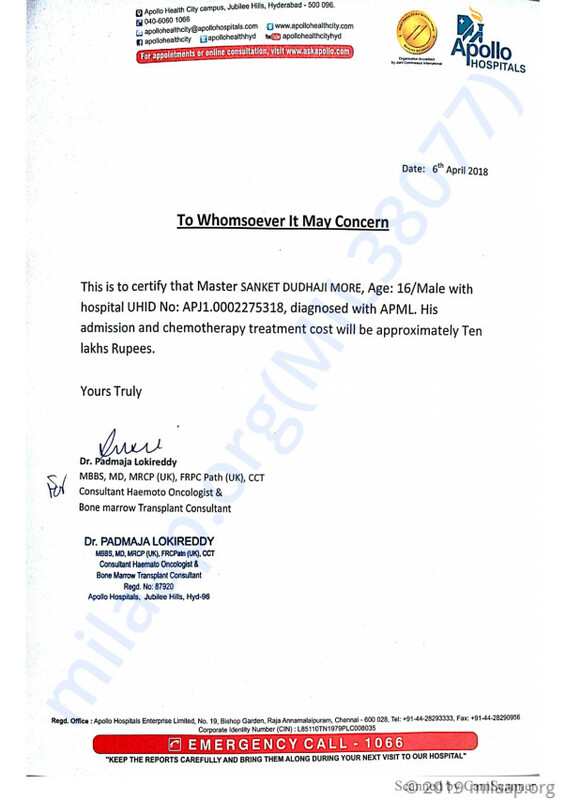 Sanket has completed one round of chemotherapy. They have very little money left with them and neck-deep in debts. They cannot continue the treatment further. 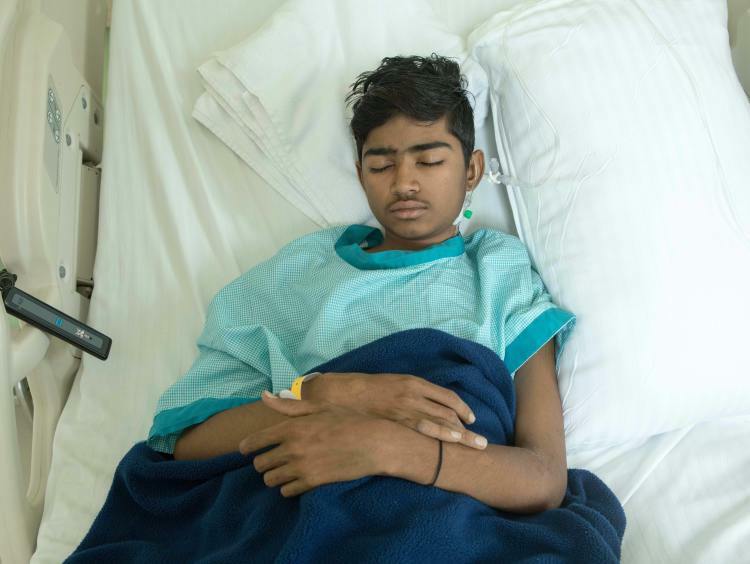 Sanket is annoyed to be in the hospital for so long. His parents do not have the courage to even utter the word cancer. They couldn't bring themselves to tell their son that he has cancer. He pleads with them to take back to his village. He doesn't know that the farm he grew up, their only source of food is sold for his treatment. 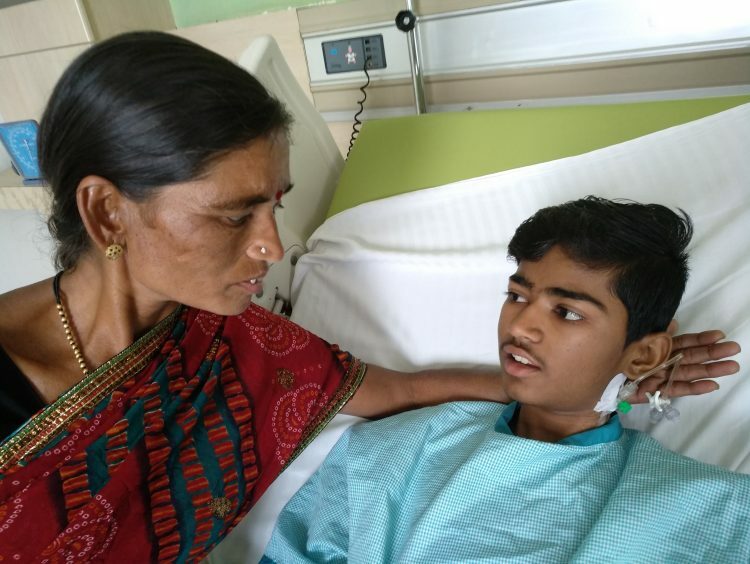 Sanket has unbearable pain and cancer in his blood may start spreading to other parts as well if the treatment is not continued. The little money his father has now by selling his farm will soon be exhausted and they will be left with nothing, even to eat. He has borrowed huge amount. 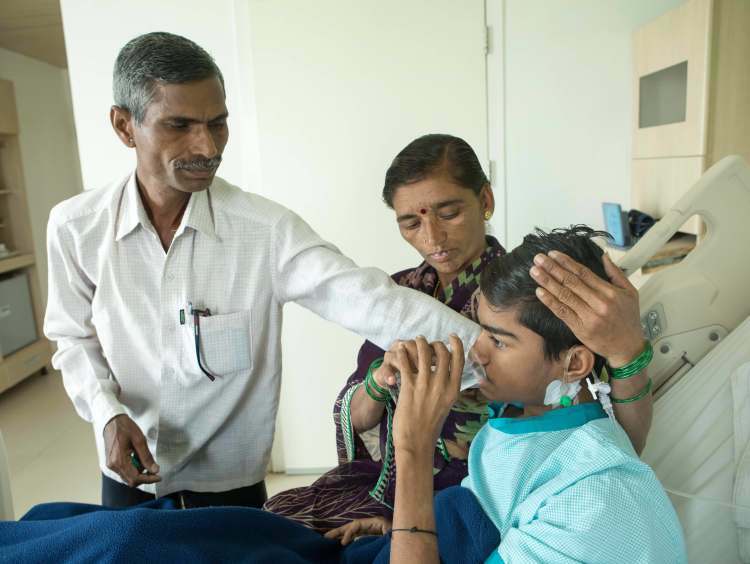 Sanket has a high possibility to beat the disease if he gets treatment at the right time. "I have lost everything I had, all I have is my son. There is nothing left in our village for us. I can't bear to go there without my son. I don't know how I can continue his treatment without money." - Dudhaji, father. 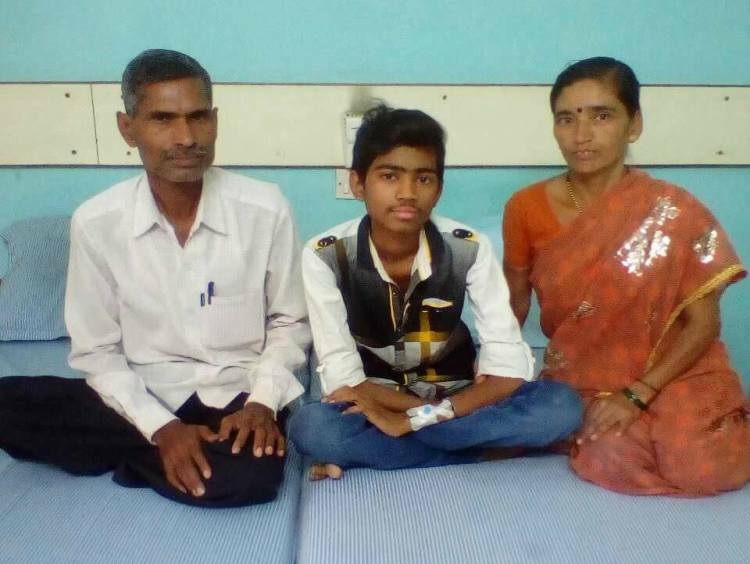 Your contribution can give Sanket a chance to live his life! Happy to share Sanket has completed his induction chemotherapy and is in Remission from Leukemia. Thank you for all the supporters. He had splenic abscess rupture and had splenectomy. recovering from this infection as out patient. Due to start remaining consolidation chemotherapy from next week.